Here's a brand new video product that your subscribers will enjoy.. Unique, Fun & Effective CTA Stingers. We designed these after noticing large and very successful companies (marketers) like IBM and Travolocity are ​capitalizing on this super hot media trend right now. Everyone is sure to get high value and a product they could use right now to help their video marketing efforts (offline or online). We've also included the Commercial License at no cost for Unlimited Client Use.. I've been quiet with our launches last year but we have a number of "first to market" products lined up to release in the coming months and if you know me at all, you know I go beyond reciprocating. So i'm hoping for your support on this one and of course look forward to supporting your upcoming launches as well.. This is a Limited 5-Day Special that your list will Love..
​*Selling on Both Platforms for this launch.. Product Buyers and after a few hours the numbers were great! 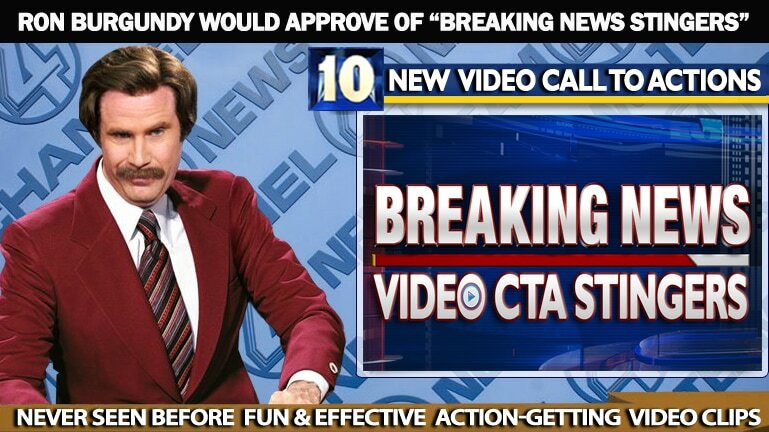 A collection of Ten (First-Ever) DFY "Breaking News" Style Call-To-Action Clips that are Fun and Effective to use in any video marketing (Offline or Onlline) . Professionally produced to emulate a network news anchor using a pro newscaster voice-over. Includes Dev Rights so these can be used on Unlimited Client Campaigns.. Works for almost any niche, covering various marketing actions that will increase engagement and conversions for all video marketing efforts..
Now users of these stingers can tap into the same powerful Attention, Emotion and Action that Large and Successful companies (such as IBM, Travelocity and Major Media Networks across the globe) use with proven results..
Also Includes 30 Offline Lead-Gen Videos that are targeted at the hottest local niches spending the most on marketing and advertising online.. These Videos Open the Door to get more offline prospects whether one is just starting to take on clients or wants to Attract More Clients for their existing offline business.. These first of a kind "Breaking News CTA Stingers" make it easy to Quickly Add Attention Grabbing and Humorous Call to Actions to ANY Video, in ANY Niche. Full training on How to Brand These Video Clips using Fast and Free Tools is included..
(Unlimited Access for Unlimited Clients when using our Pro Video Branding Tool). Part #1: 10 more "Breaking News" Stinger Clips that call for the same marketing actions but are used during the video as opposed to at the end.. These are a natural add-on to the first offer giving video marketers the full ability to use these new breaking news video stingers in all their video marketing..
using this cloud-based tool and Free Video Editors - Easy, Turn-Key Agency Style Video Branding that Offliners and Onliners can use to Brand Videos Fast and Professionally..
Never Seen Before (Not So Fake) Breaking News Stingers..
CTA clips from Nick will do just that..
And You'll stand out at the same time..
with Any Company Name (training Included). plus virtually all major media networks..
probably noticed they use "Breaking News"
add to any video marketer's arsenal..
Seen-Before DFY video "Stinger Clips"
​name as well (Dev Rights & training Included)..
proof this works is there.. The News is Top of Mind for most these days. Leads and Sales when using video marketing. ​Grab This First-Ever Pack of CTA Clips Now. Wow this video pack is really cool. video you use theme on..
from your video (Ofline or Online)..
are a Must Have for any marketers arsenal..